What's next after the pretty-pretty Mango Cheesecake & No Bake Cheesecake? Obviously, as you have already noted, Pandan (Screwpine) Cheesecake. Idea invention tumbling down from? No where actually. One of those things I suppose. One of those when you keep thinking and thinking. How far by the way I could I gone? Basically, the two previous cheesecakes being the idea ideology. After all, you tell me. Those of you who have already had a hands-on experience to baking (Lemon Cream Pie) cheesecake, I bet you know. You know which are the standard ingredients we need? Precisely. Cheese and the bottom biscuity layer. Right. But the challenger for me really was how much of, pandan/juice should I add instead of, of course, we love citrusy fruitiness and most probably can I say from mangoes (Mango Coconut Jelly, Mango Coconut Cake, Prawn Mango Curry & Mango Cucumber Salad). Or maybe even fruits, but I was so adamant about how can I incorporate Pandan juice from pandan leaves. Those of you are growing them, I bet you can connect to me? Why not to our garden harvested scent? Of course. I am one of them alright. Typical Malaysian my (Pandan Jelly With Coconut, Poached Pears in Citrus Syrup & Coconut Panna Cotta). What else should I say. Can I assume you are triggered? You like can't wait to make this Pandan (Screwpine) Cheesecake? Crush cream crackers till smooth and crumble with buttter. Press into a greased spring board pan. With a mixer on low speed, beat both types of cheese, yoghurt and sugar until smooth. Add pandan juice and eggs one by one and continue to beat. Pour over the crust and bake at preheated oven at 170C for about 1 hour or until the cake is brown on top. I love pandan flavour cakes..
hmmm pandan cheesecake .. something different.. If we can grow pandan leaves in home I will look for it because I have seen pandan leaves in many recipes. I loved both your cheese cakes especially mango one. This does look smooth and lovely with a toch of pandan leaves. Are those flowers on top edible? Bel - yes, the flowers are eatable, I bought them from the cake shop. I am 'big hantu' of cheese....I ate bread with cheddar cheese. I wonder how is the Pandan cheese taste...looking at your pics seem so tempted. 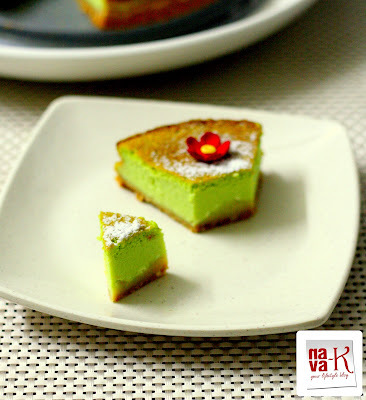 Wow,,,You know I'm a big pan of Pandan,this cheesecake make my mouth watering,great recipe Nava,I will mark this recipe for sure !! You have become quite the baker! This is a stunning cheesecake!!! This is interesting, all the flavoured cheesecakes I've made, it never occurred to me to make a pandan one! I think you did a superb job! I love the final colour too! What a brilliant idea! Looks delicious and I want a piece, pls! Your cheese cake looks pretty! I never thought of marrying pandan and cheese cake before! But you sure nailed this very well! Yummm!!! 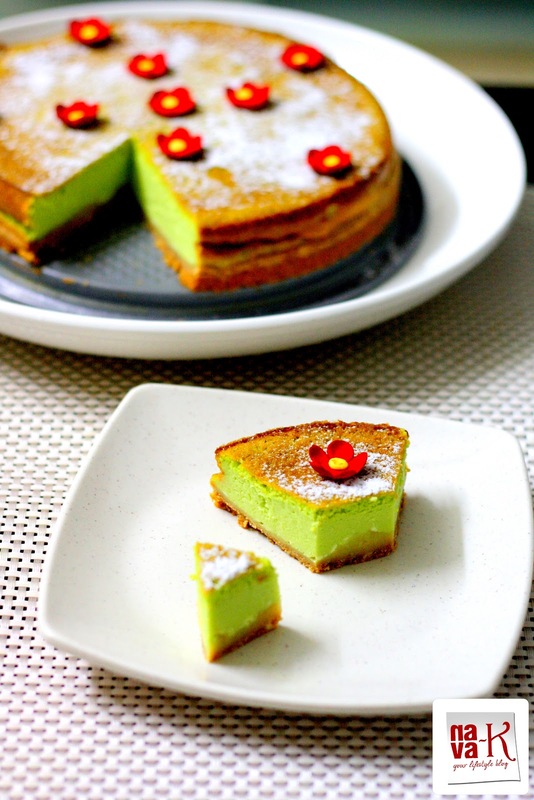 I love the green color of this cheesecake.... it looks lovely! I have used pandan leaves once when making a black sticky rice pudding for my mother. I have never really used it in anything else. This recipe sounds fantastic. 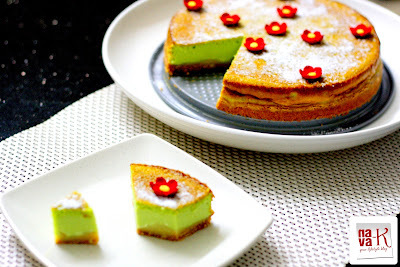 I luv cheesecake...Beautiful cake with pandan flavor..Luv the red flowers complimented well with the cake.. This is really, really beautiful! Wow! looks very colourful and beautiful! Looks so good that I will be afraid to eat it as I want to keep looking at it! Very unique. Congratulations on making the foodbuzz Top 9! I would like to invite you to share this post (and other posts :-) ) on a new photo based recipe sharing site that launched this month. The idea is simple: all recipe photographs are published within minutes of submission. And, of course, the images link back to the author's site. wow...what a delicious cake...loved that gorgeous color....also love those gorgeous pics !!!! i try this recipe with spinach leaves and use egg substitute for vegan. Wow, Nava, this is absolutely stunning!!! The color of it is just beautiful. What a unique cheesecake. Delicious! Wow cake looks stunning, mouthwatering presentation. Ahh! its looks so delicious..
lovely green color and healthy luking cake..just delicious.